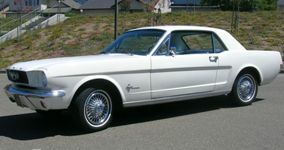 The Mustang first debuted April 17, 1964 at the World's Fair held in New York. Ford sold 22,000 units the first day! It was advertised as having the "styling and features of expensive European road cars combined with an American mass-production price." The Mustang was a intermediate sized car offered in two body styles. 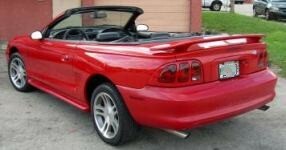 The hardtop cost a mere $2,320, while the convertible could be purchased for $2,557. The Mustang came standard with a 101hp 170ci six cylinder. Three V8 engines were optional - the 164hp 260ci, 210hp 289ci, and a higher performance 271hp 289ci engine. Other standard equipment included bucket seats, floor shifted transmissions (automatic or manual), and a padded instrument panel. After the Mustang was used as the 1964 Indianapolis 500 Pace Car on May 30th, 190 special hardtop Indy Pace Car replicas (and 3 convertibles) were built. They were special order white with a light blue triple top stripe and had no door mirrors. 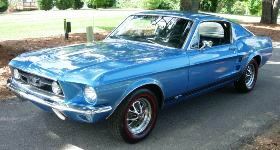 This site will call the first model the 1964 Mustang, some (including Ford) call them 1964 1/2 Mustangs, and still others contend that they are early 1965 Mustangs. Which is correct? They all are. These Mustangs are marked with a "5" in the VIN for 1965 but were all assembled before the early August 1964 plant shutdown for 1965 model year retooling. The retooling for the Mustang line included changes in engines, alternator, and trim as well as the introduction of the fastback body style. In 1965 a brand-new model; the fastback($2589), joined the hardtop($2372) and convertible($2614) as Mustang entered its first full year of production where 559,451 units would be built. The fastback had a larger backlight glass, a shorter trunk lid, functional fresh air vent on the B-pillar, and a folding back seat. All 1965 Mustangs where identical from the window line down and offered one of a 120hp(200ci 6-cycle), 200hp(289ci V8), 225hp(289ci V8), and a high performance 271hp(289ci V8). The new sporty GT package came with the V8 engine, special GT grille with built in fog lamps, a five-dial instrument cluster, an optional GT paint stripe, dual exhaust, and a special handling package. Luxury options included wood-grained vinyl trim, embossed bucket seat inserts, steering wheel with chrome rivets, and door armrests and courtesy lights. "Cobra Kits" where also first offered this year which included engine chrome dress-up parts, a Cobra distributor, performance options, dual exhaust, cam kit, heavy-duty clutch, and induction kits. Ford advertised that the Mustang could be "factory-customized" to play out your alter ego or change your life. "Mustang! Fastest million a new car ever had. And here's the sale to kick off the second million. 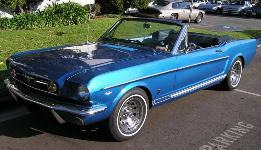 Hardtops, convertibles and fastbacks..." was the Mustang advertisement for the beginning of production for the 1966. Mustang offered "Millionth Mustang Sale" promotion personalized nameplates and for $4.95 motorized Mustang GT toy cars. After only 3 model years; in 1966, Mustang became the third best-selling individual nameplate in American industry. 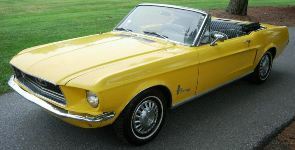 Changes included a floating "corral" around the Mustang horse on the grille; "three-toothed comb" trim on the side coves (convertible & hardtop only); a new instrument panel; and federally mandated safety items such as seat belts, padded instrument panel, flashers, and electric windshield wipers and washers. One of the new options was an Interior Decor Group for $94.13 which included four Mustang horses branded into the seat vinyl commonly referred to as the "Pony" interior. Base model prices were $2488 for the hardtop, $2519 for the fastback, and $2650 for the convertible. Engines offered where the 120hp(200ci 6-cylinder), 200hp(289ci V8), 225hp(289, V8), and 271hp(289, high-performance V8). The 1967 Mustang went through the first-ever redesign due to expected competition from the Camaro, Firebird, and Mercury Cougar. 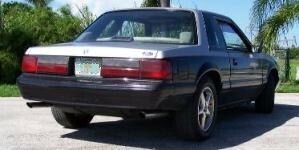 The exterior redesign included a more pronounced grille opening, the side cove ended in two sets of 4 simulated air scoops, the tail lights still had the 3 lenses but on a concave indentation panel, and the overall body length grew by 2 inches although the wheelbase remained the same. An additional high performance 320hp (390ci, V8) engine became a new option for $264. A 1967-only option of a GTA ("A" for automatic transmission) was offered. The "SelectShift" automatic transmission could also be shifted manually. New to the interior was a "tilt-away" steering wheel, overhead console, and a "stereo-sonic" tape system. In 1968, engine power was the offering. Six V8 engines where offered with the 335hp, 428ci, V8, Cobra Jet at the top. The front end lost its "Ford" letters, the side Mustang lettering changed from block-style to script-style, and the Mustang emblem became "floating" on the front grille. Extra lights on the grille were also floating. Simple chrome trim ended the body side cove at the wheel air scoops. The GT was offered with "C" stripes that followed the top of the side cove, and around the end air scoop. Early in 1968 Ford offered a limited edition "C" stripe Mustang sale which by mid March turned into limited edition Mustang Sprint sale allowing dealers to offer even more options as part of local sales promotions. 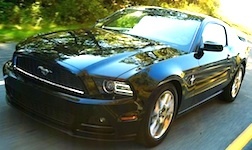 By the end of March many local "territorial" special Mustang sales existed, each with its own limited edition Mustang. Some of these included the California Special GT, the Virginia area Cardinal Special, the Pennsylvania his and hers Colt and Lady Mustang, and the Louisiana Dixie special. The California Rainbow of Colors, the Denver High Country Special, and the Seattle Golden Nugget Special were also part of the many special and limited edition 1968 Mustangs offered. 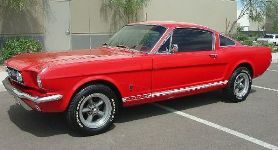 Both 1967 and 1968 saw the most number of local special and limited edition Mustangs. See our special models section for more information. The 1969 Mustang reached the top of its performance years with the largest selection of engines and sport/speed packages to date. 10 engines were offered, 8 of them were V8s. Several levels of sport/performance packages were offered. The GT option ($147 base upgrade) was offered on all body styles which started with the 351ci Winsor V8, special handling options, racing stripes, dual exhaust, hood pin type latches, and styled wheels with Argent Silver trim and GT hubcaps. 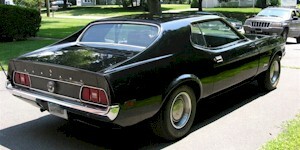 The most popular sport/performance upgrade was the 1969 introduced Mach 1 (starting at $733 over the base V8 fastback or "SportsRoof" body) which came with one of four high performance V8 engines, optional NASCAR-style hood lock pins, chrome styled steel wheels, chrome exhaust tips, color-keyed racing mirrors, and special handling. Two Cobra packages were offered: the Cobra jet with the 335hp (428ci V8) while the Ram Air induction 360hp (428ci V8) was offered on the Super Cobra Jet. The highest performance engine 370hp(429ci V8 semi-hemi big block) came on the 1969 introduced Boss which could also be ordered with a 290hp (320ci, V8, with special high volumetric efficiency "Cleveland" heads) engine. The Boss came with special "Hotchkiss" type rear suspension and many other performance options and body options to handle the larger power and seven inch Magnum 500 rims. Like the previous year, an extensive list of luxury items where available for the fastback and hardtop; but an additional luxury set under the name "Grande" was offered for the hardtop. The Grande came with a vinyl roof, plush interior, two-spoke steering wheel, full wheel covers, etc. On all body styles the indented sides scoop or cove was missing but an inverted side air scoop remained on the hardtop and convertible, while the fastback had a higher backwards C-shaped side scoop. The Mustang was longer and lower with the windshield rake increased by 2.2 degrees. The fastback roof was redesigned and was named the "SportsRoof" whose name for the fastback lasted till 1973. Inspired by the popular Shelby the front grille opening was larger, four headlights were installed, and the horse logo was mounted off center on a red, white, and blue framed vertical box. 1970 Mustang road the coat-tails of the successful introductions in 1969 with only small changes. The side coves were still gone but so was the simulated rear wheel air scoops. The air scoops moved to the front wheels as two simulated air intakes on the outside of each headlight. Taking up less room, the headlights were integrated into a larger grille opening. The Mustang grille logo remained the same 1969 smaller horse on a rectangle of red, white, and blue but moved to the center of the grille. The tail lights where also recessed into the rear panel. 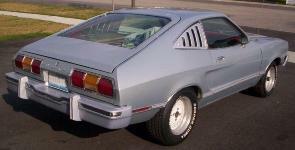 The Mach 1 option has honeycomb trim on the rear panel between the tail lights, ribbed lower aluminum rocker panel moldings with the Mach 1 lettering, a non-functional hood scoop (Cobra Jet and Super Cobra Jet engine options came with a functioning Ram Air hood scoop), etc. One other body change was to the fastback which lost is rear quarter window which was optionally louvered. GT options where gone but the Grande luxury package introduced in 1969 remained. This was also the last year of the twin Boss engine options: a 290hp(302ci) V8 and a 375hp(429ci) V8. In 1970 intense competition from the Barracuda, Camaro, Challenger, and Firebird; made Mustang lose one-third its sales. 1973 was the last of the classic Mustang fastbacks, hardtops, and convertibles. 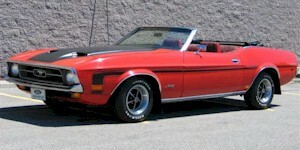 Convertible Mustangs didn't return until 1983. The 1973 grille was designed with larger "egg crate" holes, the turn-signals where integrated into the grille, and the headlight and taillight bezels where chrome. The front and rear bumpers were redesigned to handle the required Federal standards and the front bumper color matched. The engine choices of 1972 were back but with slightly better performance due to overall suspension and handling changes. 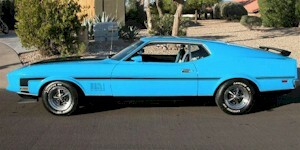 The 1973 model year marks the end of the classic muscle Mustang with the last of the large engines and Mach 1 option. The Mustang was completely redesigned in 1974 with the fastbacks turning into hatchbacks, hardtops into notchbacks or coupes, and the convertible was gone. The two remaining models were smaller and lighter, back to the way it was originally designed back in 1964. It was renamed the Mustang II. Gone were the large engines of the years prior, but the gas crisis started. 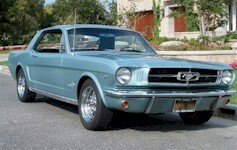 The consumer responded by purchasing more Mustangs than any other year outside of 1965, 1966, and 1967. A Ghia model upgrade was offered on the coupe which consisted of spoke-style wheel covers, a vinyl roof, deluxe color-keyed seat belts, remote-controlled door mirrors, a Super Sound package, shag carpeting, wood-tone door panel accents, a digital clock, and a super-soft vinyl or Westminster cloth seats. Ford used the 1970 acquired Ghia Italian design firm for these design choices. The hatchback could be ordered with the sportier Mach options. The most popular option was the Rallye package which included white lettered tires, extra engine cooling, a competition suspension, color keyed mirrors, styled steel wheels, dual exhaust, a digital clock and leather wrapped steering wheel. 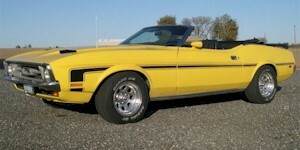 The Mustang II returned in 1975 with a few changes. The hood was longer and the engine compartment changed to allow the large 5.0L V8 engine to fit. This engine used up gas quickly, so quickly that the optional 3.5 gallon auxiliary gas tank came standard with the 5.0L V8 engine. The grille was larger with an egg-crate type mesh that was nearly flush with the grille opening. All V8's came with an automatic transmission while the V6's where manually shifted. The Ghia optioned coupe came with a half vinyl roof, rear side opera windows, full length body side tape stripes, stand-up hood ornament, media velour cloth seats, and center console. Also available was a Luxury Interior Group which was a subset of the Ghia options and similar to those offered in the 1974 Ghia package. A manually operated silver glass moonroof and a regular manual sunroof was also available. The popular 1974 Rallye package was also available for the 2.8L V6 or 5.0L V8. New cast aluminum spoked wheels were available along with the popular styled steel and forged aluminum wheels. 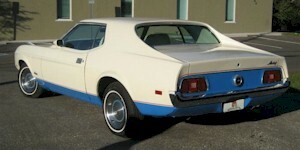 The 1977 Mustang II introduced a new set of paint colors, a much lighter simulated interior wood grain color, the 4-cylinder and V6 engines lost some power but was more efficient and lower in emissions. The front grille on all sports models were blacked out and the horizontal lines of the coupe grille was emphasized by receding the vertical slats. This was the first year of the T-roof option available on the hatchback as well as a flip-up removable sunroof, simulated wire wheel covers, and painted cast aluminum spoke wheels. The Cobra II option package increased $220 to $535 with two new color combinations of white with red accent stripes or white with green stripes. A Rallye Appearance package replaced the Stallion option and included several gold accents such as stripes, moldings, tail lamp mouldings, and stripes in the bumper rub strips. 1978 was the last year of the Mustang II, the Mach 1, and the Cobra II option package. New to 1978 was the King Cobra option at $1277. The "Boss of the Mustang stable" had a giant snake decal on the hood and pinstripping around the windows, decklid, wheel lips, rocker panels, belt, and over-the-roof area; a large front and rear spoiler, rear quarter flares, spoke wheels, and the 5.0L V8. The Cobra II got a new stripe tape treatment mid-year with tri-color tape stripes, large "Cobra" block letters midlevel on the side and decklid spoiler, a Cobra decal on the back spoiler, and a Cobra II snake emblem on a black grille. 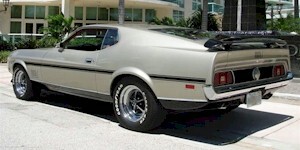 The Mach 1 remained using the 2.8L V6, styled wheels and white lettered tires, black bumpers, black lower body side paint, and a bushed aluminum instrument panel with full instrumentation. The 1979 Mustang took performance and gas savings a huge step forward with new aerodynamic queues and the use of new lighter materials to create the Fox body in a coupe and hatchback form. The Fox wheelbase was 10.4 inches longer allowing for 20 percent more interior space but the car was 200 pounds lighter. This helped since all three of the previous year's engines continued to be used along with a new turbocharged version of the smallest 2.3 liter and a midyear replacement of the 1978, 2.8 liter V6; with a 3.3 liter inline-6. The Ghia and Cobra continued in 1979 with a midyear addition of a limit run of Indianapolis 500 Pace Car replicas. Ford's bet on the Fox body and option packages was right with production sales of 369,936 units, 92% more than 1978, and nearly matching the introduction of the Mustang II in 1974. 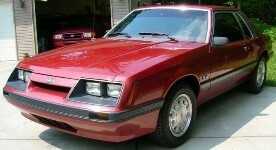 The 1980 Mustang saw improvements in fuel economy with the engine to match the new lighter more aerodynamic Fox body introduced the previous year. The base inline-4 received a 23 percent fuel economy improvement; the mid 1979 improved 200ci straight-6 remained, and just like when the Mustang II was introduced, the 302ci (5.0 liter) V8 was dropped. The Cobra option now included a unique aerodynamic front and rear end similar to the 1979 Pace Car replica. The Ghia options package was offered for both the coupe and hatchback. With the GT options package last offered in 1969 and the Mach 1 last offered in 1978, Ford organized the Special Vehicle Operations (SVO) group to build up special racing versions and create kits of bolt-on parts that the car owner could install for road and track use in IMSA or SCCA event. The Ford McLaren Mustang was also introduced later in 1980 with an emphasis on style and performance. ASC McLaren officially offered Mustang convertibles until 1987. The colors didn't change significantly in 1980 of 1979 but the use of a two-tone (above and below the body side molding) factory paint was offered with nearly every color. The momentum of the Fox body remained high with 271,322 cars built, not dropping fast as seen in the second year of the Mustang II in 1975. 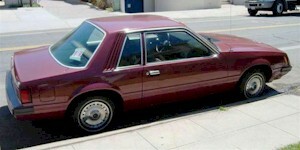 The 1981 Mustang saw mainly refinements to its options list as well as an over 20% increase in price across the board. The turbocharged four-cylinder was dropped, a five-speed manual overdrive gear box was offered, a Tracktion-Lok rear axle was new as well as a T-roof, reclining bucket seats, and power windows. 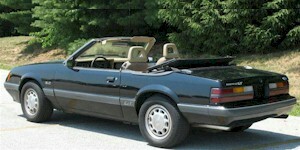 As in 1980, the two main option packages included the Ghia and Cobra. This was the last year for the Cobra option package priced in 1981 at $1588 and came with 190/65R-390 TRX tires, forged metric aluminum wheels, a 8000rpm tachometer, two tone paint, Cobra tape treatment, hood scoop, sport exhaust, dual black sport mirrors, black bumper guards, dual accent stripe body side moldings, and black moldings around the windows. A Cobra package taping delete option existed to save $65 but the special, large Cobra hood decal was an additional $95 option. A special sports package was offered which upgraded the engine, exhaust, blackout treatment, and added hatchback louvers or rag carriage coup top. 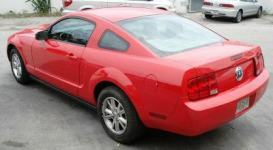 An economically priced "S" model coupe package same with limited trim options. Two tone paint options continued but most required a black lower color except for Medium Pewter over Light Pewter, Red over White, and White over Bittersweet. In 1982 Mustang brought back the GT and the 5.0 liter engine. 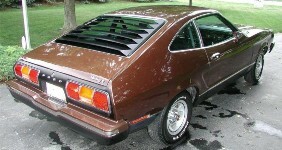 The GT had a forward opening non-functional hood scoop and a redesigned front grille with two horizontal louvers extending in front of the vertical slats. 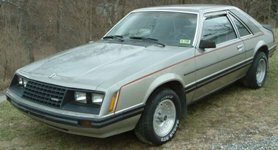 With the lighter Fox body style and the new 157hp 302ci engine, the GT recorded the fastest zero-to-60 mph time of any American car in 1982. Banking on European interest the options packages of the hatchbacks and coupes were renamed with European model nomenclature as L for the base version, GL with a few upgrades, GLX with many of the luxury upgrades which replaced the previous years' Ghia, and GT which was only offered as a hatchback. Exterior colors stayed relatively the same as 1981, a light Opal replaced the golden Caramel interior, and all Ford engine blocks where now painted light gray. In 1983 the Mustang convertible came back after being gone for nine years. The convertible was a 1983 midyear introduction and only came in the GLX trim package; but had an electric top, a real glass rear window, and a comfortable back seat. Reluctant to make the manufacturing change, Ford used Cars & Concepts of Brighton, Michigan to convert steel topped coupes from the factory into these convertible. The grille on all models became smaller between the two more deeply recessed headlights allowing for a strip of body color to return between. More power was under the hood when the 2.3L 4-cylinder was upgraded with a more efficient one barrel carburetor; the old inline-6 was replaced with an "Essex" 3.8L V6 which improved the horse power from 87 to 105; the turbocharger returned on the 2.3L 4-cylinder replacing the 4.2L V8 with 25 more horse power; and a new four-barrel carburetor, aluminum intake manifold, a high-flow air cleaner, and valve-train modifications pushed the 5.0L V8 from 157 to 175hp. All tires also increased by at least one size in 1983. Even with all these changes, 1983 saw the lowest number of Mustangs sold to date at 120,873. The 1984 Mustang was marked with the continual evolution of the Fox body, more engine performance options, the 20th anniversary models, the SVO GT is introduced, Saleen starts to modify Mustangs, and the year yellow disappeared not to return again until 1988. The base L model stays but the GL was combined with the GLX to form the LX model. The GT remained but with a new front air dam with optional road lamps. 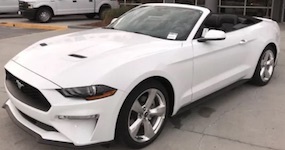 The 20th Anniversary Edition Mustang were all convertible GT's in Oxford White with red interiors, powered by the 302ci V8 or turbo charged 4-cylinder, G.T.350 lettering and stripe (which Ford got in trouble with Shelby with for not licensing), original 1965 type front fender emblems, and two 20th anniversary dash badges. The newly developed Ford Special Vehicle Operations department put together a performance model offering its upgraded 4-cylinder turbocharged engine, body trim, and handling options. New to the interior on all cars where red dash instrument lighting and split folding rear seats. 1984 marked the first year of an increase in cars sold since 1978 which will continue until 1990. In 1985 Mustang built upon its last few years of more power and style by offering upgrading its SVO turbo charged 4-cylinder by 30 horse power to 205hp and improving its top 5.0L V8 by 35 horse power to 210hp. This was the last year of the 145hp 4-cylinder turbo GT since the V8 offerings had more power. The L series was dropped making the LX the base with the GT and SVO as upgrades. Just as in 1983, the tires on all models were increased in size again. The grille was changed to match more with the SVO but with an open slit at the bottom. All Mustangs also had a front air dam with four rectangular holes in the center. GT's received integrated fog lamps and the SVO received more flush headlamps. The tail lights on all models were full width with only an opening for the license plate. Sales rose again with 156,514 cars being produced. 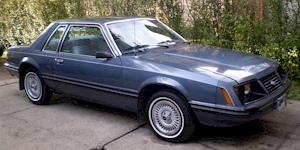 1986 Mustang marked the last year of the SVO and its turbo charged 4 cylinder engine, due to government regulations a third break light added, two gray and two blue colors were removed, and number of engine options dropped to the 4 cylinder with and without turbo, a V6, and a redesigned high output V8. The redesigned V8 had a multi-port fuel injection system. 1986 had its largest production year since 1979 with 224,410 cars built which has not been beat since. The 1987 Mustang came in the standard three body styles of a 2-door coupe, 3-door hatchback and a convertible. The GT optioned hatchback continued to be available but the SVO was gone. Continuing the 1986 reduction in engine offerings, 1987 saw only two: a new 225hp, high output, 5.0 liter, V8; and the 90hp, 2.3 liter, inline 4-cylinder. For the first time in eight years the body was redesigned a bit by removing the solid louvered panels behind the rear side quarter windows on the coupe and hatchback; placing a molded rear wing on the GT hatchbacks; and adding flush mounted, body molded headlights. Much of the front end redesign came from the removal of the 1940 to 1983 governmental regulations on the use of discrete, self contained, standard headlamps. The grille was also modified by making the GT's grille solid and the base LX's grille open with the ford logo suspended on a horizontal integrated, color matched bar. Ford didn't expect these changes would increase interest and was short parts for an estimated 10,000 cars by years end. In 1987 ASC McLaren started offering custom convertibles made from 2-door coupes. 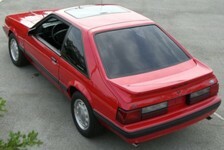 The 1988 Mustang offered the same two engines first offered in 1987 a 2.3L 4 cylinder or a 5.0L V8. All three body styles of a 2 door coupe, 3 door hatchback, and convertible came in the base level FX options group; while the hatchback and convertible also came in a sportier GT. 1988 was the first year there were no basic body line or front grille changes between the LX and GT. The GT came with the larger engine, dual exhaust, better handling options, and the Aero Package which included a rear spoiler, styled 15x7 inch aluminum wheels, upgraded tires, round Hella fog lamps, center console, high back bucket seats, and tinted windows. Yellow also came back as a standard color which was last offered in 1983. 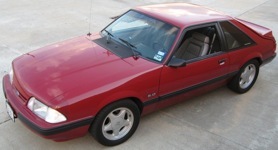 1989 was the 25th Anniversary of the Mustang but the Anniversary model didn't come out til 1990 although special 25th Anniversary badges did appear above the glove box after April of 1989. The engine offerings remained the same as the previous year but the V8 got a SEFI mass airflow system. A sporty 5.0L LX with GT adjustable front seats was also offered for the first time as a standard options package. 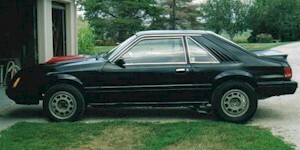 So popular was this LX 5.0L option, the 1989 Mustang model year did not officially end until September of 1989. The 1990 model year followed the 1989 production year with the same three body styles (coupe, hatchback, and convertible), two main option styles (LX or GT), and two engines (2.3L 4-cycle, and 5.0L V8). A popular LX upgrade was the 5.0L engine which included a 5.0 fender badge and dual exhaust. Late in the model year, Deep Emerald Green exterior paint was offered on a convertible with the 5.0L V8, white interior, and GT wheels. Most 1990 cars (as did most late 1989 Mustangs) received a 25 anniversary tri-bar pony dash emblem. Mandatory driver side air bags and rear seat shoulder belts made its debut in 1990. This was also the last year of the Mustang ASC McLaren convertible modification which first debut in production quantities in 1987. 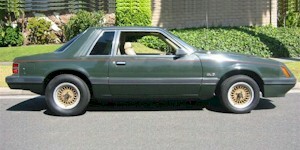 The 1991 Mustang came in three body styles and two options packages. The body styles continued to be the notchback 2 door coupe, the 3 door hatchback, and the convertible. The coupe only came in the basic LX while the hatchback and convertible had the LX and sporty GT choices. New to 1991 was the very popular 16x7 inch, 5 spoke, aluminum wheels. After introduction, many earlier Mustang owners purchased these wheels as an upgrade. The base level 4 cylinder got a power increase to 105hp by adding an extra spark plug to each cylinder bringing the total to 8. Other changes included a new convertible top which retracted into a more body flush profile and a graphic equalizer option. Fans of yellow were disappointed in 1991 when the color was dropped, returning in 1993. 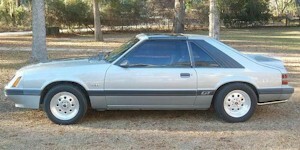 The 1992 Mustang was offered in three body styles: notchback coupe, hatchback, and convertible; and with the standard LX or sporty GT options package. 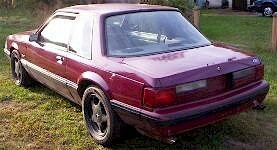 All 1992 Mustangs now had color matched body side and bumper moldings on all models by adding them to the standard LX series. In 1992, the rear bumper got its signature embossed Mustang letters, to remind us that despite what the car looks like, this is a Mustang. The two new colors of Bimini Blue and Calypso Green was introduced. And a special Feature convertible FX model was offered in Vibrant Red with a white interior and top combination. Ford was gearing up for changes in the 1993-94 Mustang, so overall changes in 1992 was minimal. The 1993 Mustang came in three packages. The base LX (240A) package, the LX 5.0L (245A) which added the V8 engine, and the GT (249A) package which added air conditioning, a cargo tie down net, floor mats, and optional two-tone paint. Three body styles were available - the notchback coupe, hatchback, and the convertible. 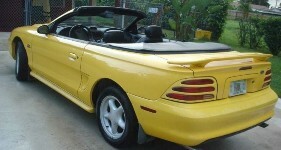 Similar to the 1992 Vibrant Red Feature convertible, in 1993 a Canary Yellow and an Oxford White Feature convertible. Horsepower dropped across the board after re-rating the changes over the last few years plus not rating them with the extra loads of smog, alternator, air conditioning, and the cooling fan. The biggest news in 1993 was the introduction of the SVT Mustang Cobra built by Ford's Special Vehicle team to bring back the high performance interest in Mustang. The SVT Cobra had a modified body style, better handling, and 235 horsepower. The 1994 Mustang got the first complete redesign since 1979 in this 30th Anniversary of the Mustang. 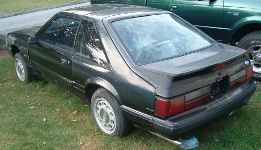 The body styles were reduced from three to two by combining the fox body notchback coupe and hatchback into a sloped back coupe reminiscent of the 1960's Mustang fastback body style. Overall body styling changed by adding general curves and bringing back the side coves and front grille pony. All body trim was removed, the rear tail lights wrapped flush with the body, and continuing a tradition started in 1987, the rear bumper embossed with the Mustang letters to tell everyone that a Mustang has just sped past you. Another big change in 1994 was the replacement of the unpopular base level 4 cylinder engine with a 3.8 liter V6. The GT sports package came for both the coupe and convertible but added a 5.0 liter V8. An unusual convertible option was a removable hardtop which ended up on only about 500 of the 1994 and 1995 models. The SVT Cobra came in the same coupe and convertible but added a new front fascia with integrated fog lamps, Cobra snake emblems, a custom rear spoiler with built-in LED stop lamps, better handling, and upgrades to the V8 engine allow for 25 more horsepower. 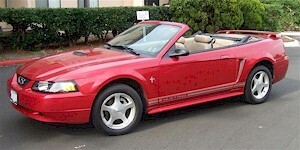 The 1994 Indianapolis used a Rio Red SVT Cobra convertible as its Pace Car allowing Ford to create a special run of pace car replicas. In 1994 Larry Shinoda, original designer of the 1969 Mustang Boss, started modifying Mustang GT's and SVT Cobras. 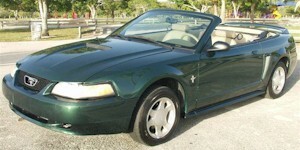 1995 Mustang was a carryover from 1994 with two body styles: a 2 door coupe and a convertible. There were however a GTS and Cobra R special model added to the base V6, the GT V8, and the SVT Cobra V8. The GTS had the GT V8 engine, GT transmission, GT rear axle, and 16.5 inch sport wheels. 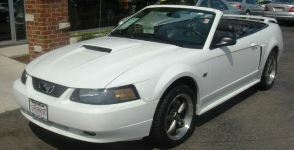 The Cobra R came only in Crystal White and was equipped with Ford's 300hp, 5.4L, racing V8 engine and better handling. 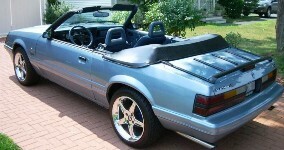 Some 1995 convertibles received the optional hardtop. 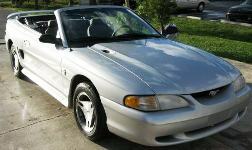 The 1996 Mustang came as a 2 door coupe or convertible and in a basic V6, GT V8, or high performance SVT Cobra V8 model. Major style changes included vertical barred tail lights and a larger hood cowl for the SVT Cobra's new modular engine. Both the GT and Cobra got this new 4.6L V8 modular engine. A new color named Mystic made its debut in 1996 on the SVT Cobra, a color which changed from purple to green to gold depending on the lighting. 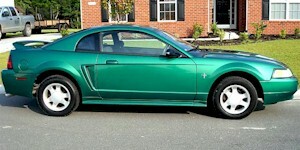 1997 Mustang changes included a larger grille opening to match the larger fan and radiator for better cooling. All models also received the passive anti-theft system (PATS) used on the 1996 GT and Cobra. All automatic transmission had a new thicker shifter. The GT got new 17 inch wheels with a gray metallic center. And Bright Tangerine and Mystic exterior paint was replaced with Aztec Gold, Autumn Orange, and Pacific Green. The 1999 Mustang appearance changed by creating wheel lips, widening the body side cove, raising up the rear decklid, pulling the front fascia in, and adding angles to the grille and other areas to more match the classic 1960's Mustang. Only the roof remained the same. The V6, GT V8 and Cobra V8 engines all received upgrades which resulted in more power. A 35th Anniversary Limited Edition options package for the GT added 17 inch wheels, black trim and tape hood treatment, and a special black and silver interior. 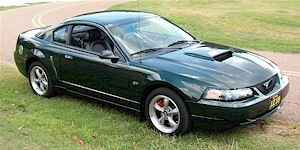 The 2000 Mustang was mostly a carryover from 1999. Small changes included rear child seat anchor brackets, a glow in the dark interior trunk release, and a new gold exterior paint. The Ford Special Vehicle Team only produced 300 SVT Cobras in 2000 but they were designated as an "R" series which included performance and appearance upgrades as well as a special hand built and assembled engine. Even with fewer SVT Cobras built, 215,239 Mustangs were sold in 2000, this was the best year since 1986. 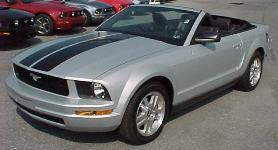 The 2001 Mustang was mainly a carry-over year with the same styled 2 door coupe and convertible offerings from the previous year. Three models were the base level V6, the V8 GT, and returning from 1999 the higher performance standard SVT Cobra but with the word Cobra embossed on the rear bumper. In 2000 only 300 special SVT Cobra's were built. The biggest news in 2001 was the introduction of the Black or Highland Green Bullitt special model GT coupe based on the 1968 fastback driven by Steve McQueen in the 1968 detective movie Bullitt. Famous for its car chase scene on the streets of San Francisco, there were many third party Bullitt kits available. 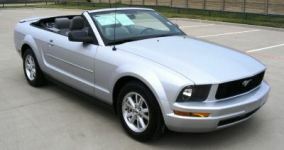 The 2002 Mustang came in a 2-door coupe and a convertible which had the same features as 2001 except for a new True Blue exterior paint and a new sound system. Contrary to most sources, 100 SVT Cobras were built in 2002, but all were sold in Australia. 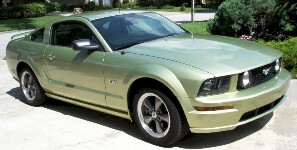 The 2003 Mustang introduced several new option packages and special models. Ford's Centennial was celebrated with a 100th Anniversary optioned coupe and convertible in black with black premium painted wheels, chrome rims, and a two tone parchment interior. 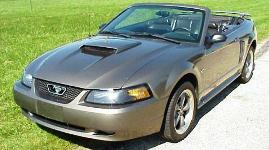 The Mach 1 came back in 2003 a coupe with special wheels, stripes, a double overhead cam 4.6L V8, and hood scoop. The SVT Cobra also celebrated an anniversary, its 10th with an addition of a supercharger; a new front fascia, hood, flared rocker panels, rear fascia; and a new interior. Design elements from 40 years ago come back in the redesigned 2005, 40th anniversary Mustang. Mustang attitude from the 1964 to 1968 grille is back from its slightly slanted forward design to suggest a forward jetting hood, recessed round headlights separated from the grille by a color-keyed integrated body panel, separate turn signals lower in the bumper, optional fog lamps mounted in the grille field, and the Mustang galloping horse badge in the center. The rear has the three separate tail lights which do not wrap around to the sides, a simulated center gas cap badge, and no large recessed "MUSTANG" letters to remind us that this is a Mustang. The side coves are less pronounced than the 2004 and there is no simulated wheel air scoop at the end, but smaller rear quarter windows set apart from the door windows brings back elements of the fastback body line. Only two engines are available but they are the powerful 208hp, 4.0 liter, V6; and the 300hp, 4.6 liter, V8. The interior options include color-configurable instrument panel where a touch of a button can select more than 125 different background colors. GT options are available for both the coupe and convertible body styles. With this redesign comes a change in manufacturing location from 40 years in Dearborn, Michigan, to new facilities 20 miles south in Flat Rock, Michigan. 2006 Mustang returns with its popular retro redesign. Differences over the previous year include: choice of Standard, Deluxe, and Premium series options; optional 18-inch wheels for the GT, two new paint colors Vista Blue and Tungsten Gray; and the V6 Pony Package which includes some GT parts, Pony badging and lower door stripes. 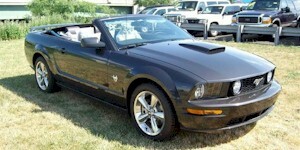 The 2006 Mustang is available in two roof styles - the coupe and convertible. It is offered in the base level V6 model and the GT model. 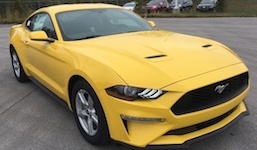 The GT model adds a V8 engine, anti-lock brakes, dual exhausts, fog lamps in the grille, rear decklid spoiler, 17-inch wheels, and a 6-way power adjustable driver's seat. Both models can be upgraded to the Deluxe option which includes the Shaker 500 Audio system and a seat upgrade. 2006 also sees the return of the Mustang Shelby as an upgrade GT for Hertz, the GT-H.
2007 Mustang continues to refine its offerings by dropping the V6 standard leaving eight option groupings (V6 deluxe, V6 premium, GT deluxe and GT premium on either the coupe or convertible). Grabber Orange returns from being retired in 1970 and Alloy is added to the exterior paint choices. An auxiliary audio jack, SIRIUS radio option, and an interior Comfort Package is new inside. The GT is offered with new GT California Special and GT Appearance Package which adds front and rear fascias, spoiler, side scoops, hood scoop, sport wheels, exhaust tips, side stripes, and Pony emblems. Other carry-over option packages include the Comfort Group, Exterior Sport Appearance Package, Interior Upgrade Package, Premier Trim with Color Accent Package, Satin Aluminum Instrument or Woven Charcoal Aluminum Instrument Panel Applique, Sport Appearance Package, and V6 Pony Package. A new wheel option joins the six continued from 2006, the 17 inch bright machined cast Aluminum wheel with large tri-bar Pony center cap option on the GT. Why mess up a good thing. 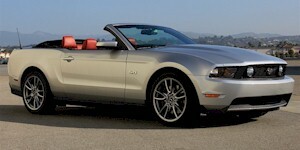 The Mustang returns in 2008, virtually unaltered for its 4th year. Changes are mainly in the options. Side impact air bags become standard. New options include: ambient interior lighting; HID headlights; V6 18-inch wheels; a new V6 safety and security package; and a Warriors In Pink package for the V6 Premium coupe or convertible with automatic transmission. 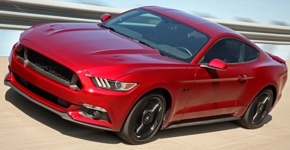 Models include the base level V6, GT, Shelby GT, and SVT Shelby GT500. Both the V6 and GT models are offered in the Deluxe or Premium versions - where the Premium upgrades the audio system and seats. 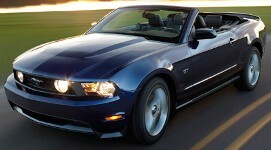 2009 was a short year (6 months) for the Mustang with the 2010 redesigned model coming out earlier than normal. Additions in 2009 include Brilliant Silver clearcoat metallic exterior paint replacing Silver, a glass roof option, 45th anniversary year fender badges, and a GT security package. Special models continue to be the GT, GT California Special, Bullitt, Warriors in Pink, and the SVT Shelby GT500 and GT500KR. The 2010 Mustang has a new front and rear end, new colors, many interior colors, a redesigned dash and gauges, and new wheels just to name a few. The front grille is narrower and the back end is higher and smoother. 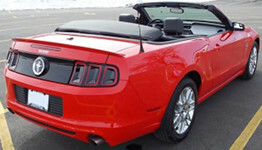 The 2010 Mustang comes two body styles (coupe and convertible), in both a 4.0L V6 and 4.6L V8 GT, and each with a standard or premium options group. The largest changes to the options groups are a new GT grille and pony emblem, 3.75 rear axle performance package, an addition of 19 inch wheels, color matched mirrors, dual interior climate controls, voice activated navigation system, and a reverse camera system. Grabber Orange is gone but Grabber Blue is back. There are two new shades of red, Grabber Blue joins a new darker blue, and a new medium grey joins the silver, black and white from 2009. The 2011 Mustang V6 and GT has a new aluminum block/piston, double over-head cam, engine with increased horsepower, better fuel efficiency, and higher (7000rpm) redline. Both the V6 and GT also has a new tuned dual exhaust, 160mph speedometers, and new wheel offerings. 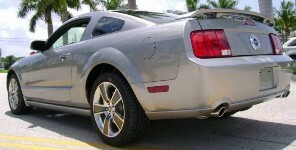 That's right all Mustangs now have dual exhaust! Three new colors include Yellow Blaze, Race Red, and Ingot Silver. The GT has 5.0 fender emblems to match its 5.0L V8 engine, and the V6 is can be ordered with a bright Billet style grille found on the Mustang Club of America limited edition. 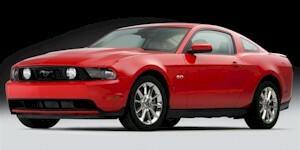 The Boss 302, Boss 302 Laguna Seca, and Lava Red exterior paint are new for 2012. Grabber Blue and Yellow Blaze paint, the Mustang Club of America Edition, and the Shelby GT500 remains; as well as dual exhaust standard on all models including the V6. The high-performance 2012 Mustang Boss 302 features a unique exterior treatment, race-inspired wheels and aerodynamics and a high-revving 444-hp version of the company's all-new 5.0-liter V8. Stay tuned for more photos and information. The limited-edition 2012 Mustang Boss 302 Laguna Seca takes the Boss spirit even further, resulting in a race-ready version of the Mustang. 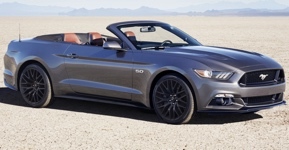 The 2013 Mustang continues with two basic body styles: the coupe and convertible. New 2013 design features include the hood, grille, HID headlamps, body color rocker panels low on each side, wheels, rear taillights, rear decklid panel, rear license plate trim panel, instrument panel with 4.2 inch "Track App" LCD display, new heated mirrors with Pony projection lights (projects a Pony on the ground just below the mirrors when the door is opened), and push button automatic gear select to name a few. New colors include School Bus Yellow, Deep Impact Blue (replacing Kona Blue) and "Gotta Have it Green". Models include the V6, GT, Boss, GT500, and Cobra Jet. The 2014 Mustang is available in both the coupe and convertible body styles and the base level V6 and GT version with the V8 engine. Some of the significant changes include two of the paints. Performance White (HP) will be changed to Oxford White (YZ). Red Candy Metallic with the tinted clearcoat (RZ) will be changed to Ruby Red Metallic with a tinted clearcoat (RR). Gone is School Bus Yellow paint which was for the Boss 302 - and it appears so is the Boss 302 special model. Two new option packages are now available. The FP6 appearance package is new for the V6 Mustang. This package includes painted black outside door mirror skull caps, painted black rear decklid spoiler, quarter window louvers, and 18-inch painted black aluminum wheels. The FP8 appearance package is new for the GT Mustang. It is similar with the exception of 19-inch bright machined-aluminum wheels with black painted windows. 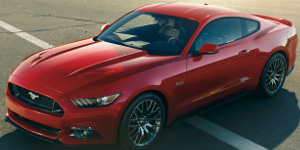 The 2015 Mustang is the first in the sixth generation and celebrates the 50th Anniversary of the Mustang. 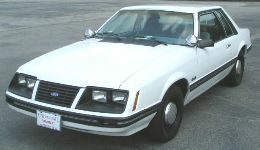 Although the design is all new, many elements reflect the original as well as the newer Mustang: trapezoidal grille with honeycomb panel, round headlamps next to three vent features inset into a mean sweeping look case, short hood cowl and louvered/vented hood, recessed side panels, long hood, long sweeping fastback rear, and angled three pillar rear taillights to name a few. Standard U.S. models comes with a 300hp 3.7L V6. The GT with a 420hp 5.0L V8. There is also an optional 305hp 2.3L turbocharged 4-cylinder. The 2015 Mustang is available as a coupe or convertible, and also a available in Europe (first time side the 1965-79 T-5 Mustang). 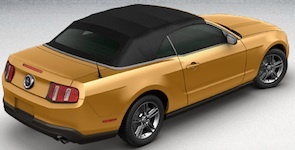 New exterior colors are Triple Yellow, Competition Orange (returning from the 2012 Boss Mustang), Magnetic metallic gray, and Guard metallic gray. There is also a Wimbledon White or Kona Blue 50th Anniversary Edition Special Mustang GT coupe. The 2016 Mustang comes as a 300hp V6, 310hp Turbocharged 4 cylinder Eco Boost, 435hp V8 GT, and a new 526hp Flat Plane Crank V8 Shelby GT350. The V6 Pony Package and California Special GT are special upgrade packages along with a special Shelby GT350R. New to the GT are in-the-hood turn signals similar to the ones in louvered hood of the 1968 Mustang. The 2017 Mustang follows with the same major model/engine combinations as the previous year with a 300hp 3.7L V6 model, a 310hp 2.3L turbo 4-cylinder EcoBoost model, a 435hp 5.0L V8 GT, and the special 526hp 5.2L V8 Shelby GT350. All model come as a door-door coupe fastback or convertible but the GT350, which comes only as a fastback. Special equipment groups include a GT350R Package, a Black Accent Package, California Special, EcoBoost Performance Package, GT Performance Package, and Pony Package. 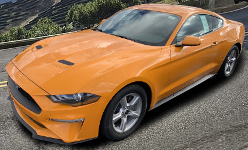 As far as exterior paint colors: Grabber Blue is back, White Platinum is new, where Avalanche gray is only for the GT350, new Lightning Blue replaces Deep Impact Blue, Guard green is gone as well as Competition Orange. The 2018 Mustang features new paint colors, new designed features inside and out, and more power. New paint colors include Orange Fury tri-coat metallic and Royal Crimson tinted clear coat and the return of Kona Blue. On the outside there is a list of redesigned features: front grille, hood with new hood vents, LED turn signals and optional fog lamps, front fenders, rear end, tri-bar LED taillamps, quad exhaust tips for the GT, optional over-the-top racing stripes, and 12 optional wheels. On the inside there are new patterns and colors for seats, optional heated steering wheel with leather, optional new 12-inch all-digital display instrument cluster, new hand-stitched center console, and optional SYNC Connect with FordPass. For performance: the 5.0L V8 and 2.3L EcoBoost has more horsepower and torque, optional 10-speed automatic transmission, optional active valve performance exhaust, upgraded chassis for improved ride and handling, and optional MagneRide damping system. The Shelby GT350 and GT350R is back as a carry-over design from 2017 with the new 2018 paint colors but not the other 2018 Mustang changes to the exterior and interior. The 2019 Mustang sees some new exterior paint colors, new fine tuned design inside and out, and some new special limited editions. New exterior paint colors include Need for Green, Velocity Blue and a special Dark Highland Green for the 50th anniversary Bullitt Mustang. The California special is back and so is the Shelby GT350. For the 2.3L EcoBoost, a new class-exclusive active valve performance exhaust is available. With this exhaust, owners can set it to a quite start, or sport for waking up the neighbors. Also new is the optional B&O Play Premium Audio System from Harman. SYNC 3 AppLink now includes Amazon Alexa.